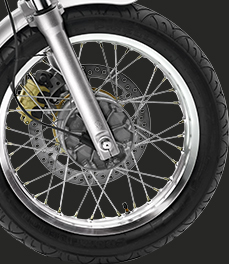 The Royal Enfield Continental GT EFI is the lightest, fastest, most powerful Royal Enfield in production. It’s a machine with a story, a nod to motorcycling’s finest hour; a painstaking collaboration. It is also the best expression yet of a cultural phenomenon that has simply refused to fade away – the café racer. Fuel Injected 535cc unit Construction Engine, 29.1 bhp power, 44Nm torque, lighter flywheel along with improved power-to-weight ratio gives the Continental GT that extra responsiveness, punch and agility. Nimble, flex-free double cradle frame for superior rigidity and razor-sharp handling that makes the Continental GT respond naturally and instantaneously to the body. An expert or beginner can have a lot of fun whether on a race track or on their favorite set of ‘twisties’. This all new frame has been designed in consultation with Harris performance. Foot rests and controls placed further back for a sporty riding position in sync with traditional Café Racer styling. Available in GT Red, GT Green and GT Black.